This vinegar is kept for more than 3 years in oak barrels which accounts for its delicate flavour. Lovely with Italian antipasti, braised radicchio and gorgeous in a salad. This Balsamic vinegar is reduced which accounts for the thick, rich and concentrated syrupy texture. Great with cheese, red fruit or in a salad. A Balsamico which is made of 100% grape must. The vinegar is lagered for a minimum of eight years via the solera process, making for an intense and rich flavour. A white balsamic vinegar which is fresh and complex at the same time due to the years of lagering. A simple balsamic vinegar which is made to be used royally in marinades, stews or in gravies. Another tip: pickling small onions in balsamic vinegar! 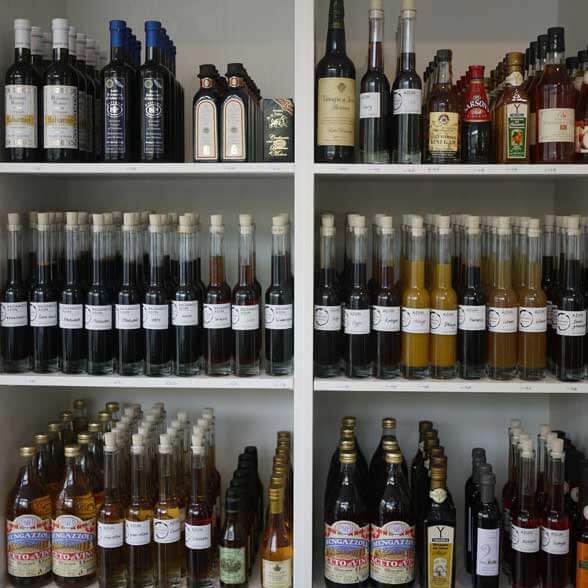 A balsamic vinegar which is made from grape juice which is not reduced and white wine vinegar. It is a white light fresh and sweet vinegar that doesn’t colour the salad and tastes delicious. Aceto balsamico is from the house of Vetus in Modena. This vinegar has been ripened for eight years. It is a silky, sweet and sour and somewhat syrupy balsamic vinegar made of unfermented grape must. A fresh vinegar made of sherry, with a woody and nutty flavour. Very nice in a vinaigrette with Spanish olive oil and essential in gazpacho. Made with Pedro Ximenez sherry with a raisin and caramel flavour. A mild wine vinegar from Austria, lovely in a vinaigrette or marinade. Vinegar made from the superb Italian Barolo wine, as deep and full as the wine itself. A Spanish red wine vinegar, ripened in oak barrels with a sherry-like taste. A Spanish wine vinegar from Muscat grapes. The flavour is fresh and sweet and great when you prefer a less acidic taste. A white, fresh wine vinegar from the Champagne region. A wine vinegar made from the well-known Austrian wine, with a floral taste yet not sweet. A great, straightforward Italian vinegar, in red and white. Perfect for cooking.